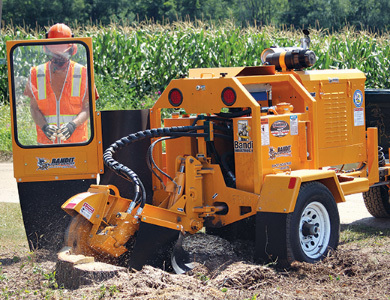 Most Bandit stump grinders feature beltless hydrostatic direct-drive for the cutter wheel, significantly reducing maintenance costs and machine downtime by eliminating the numerous belts, clutches, bearings and associated components found on traditional stump grinders. Unique pivot points and unparalleled power, these are the stump grinders you want on your work site. 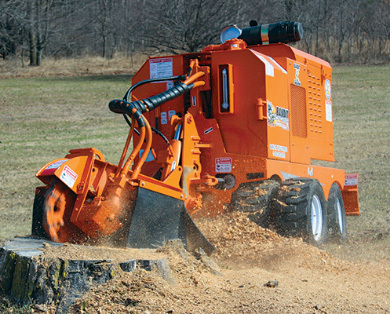 With built-in safety measures, don’t trust any other stump grinder for your job. Bandit has been leading the industry for nearly two decades. Strong, dependable equipment translates to a strong bottom line. 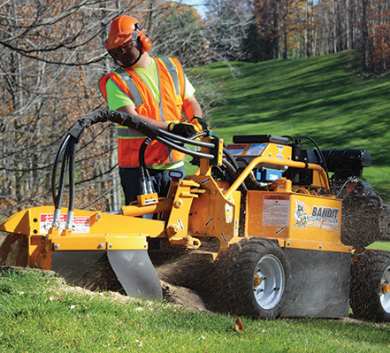 The Bandit® Model HB20 features a unique center-pivot design that takes the work out of using a handlebar stump grinder. Self-propelled with a 25-horsepower engine and a 15-inch diameter cutter wheel, the Model HB20 is both easy to use and very effective on small and even medium-sized stumps, making it a favorite small stump grinder for rental companies and stump grinding professionals. 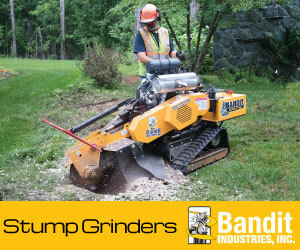 Bandit Industries’ Model ZT1844 stump grinder is the most productive compact, track mounted stump grinder on the market. It features all the power and performance of every Bandit® stump grinder, but with features that make it an ideal machine for rental companies or dedicated stump grinding professionals. 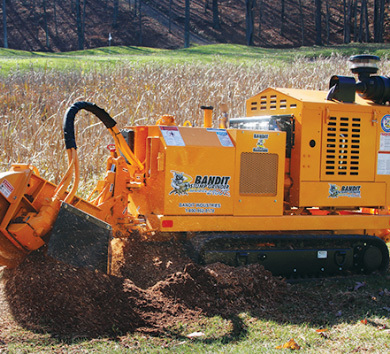 The Bandit® Model 2250R is compact, cost-effective and aggressive when it comes to performance. Featuring a 21-inch diameter cutter wheel with direct hydrostatic drive and a class-leading side-to-side cutter swing, the 2250R can grind small and medium-sized stumps quickly and efficiently. Large flotation tires and a two-wheel drive self-propelled undercarriage takes the 2250R across delicate lawns without issue, and at 35 inches wide, it fits comfortably through backyard gates. 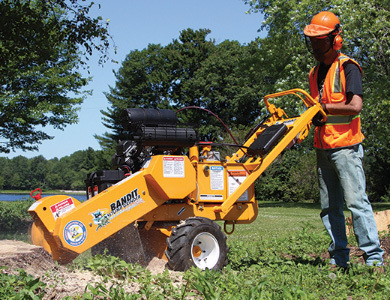 The Bandit® Model 2550 has quickly become one of Bandit’s most popular stump grinders. It has the all-terrain capability to reach remote stumps, but still retains excellent maneuverability as both a wheeled and track machine to carefully traverse delicate lawns, fitting through 36-inch gates. Combined with a wide grinding swing, the Model 2550 has the versatility to handle both large stumps in land clearing projects, and small backyard removals. The Bandit® Model 2650 is an outstanding mid-range stump grinder with standard four-wheel drive and aggressive diesel engine options for power. This machine is also available with an expandable rubber-track undercarriage for excellent all-terrain capability while still fitting through narrow backyard gates. 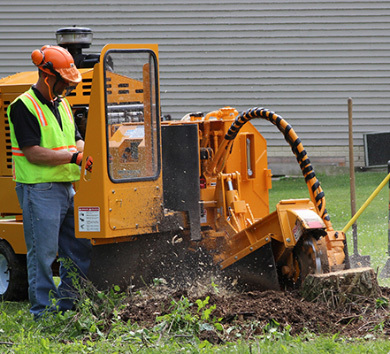 The Model 2650 can tackle big stumps while still being manueverable enough to handle smal backyard removals. 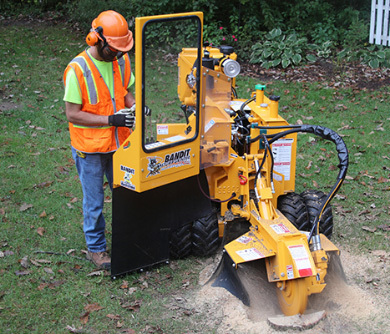 The Bandit® Model 2600 Towable is a powerful mid-range, cost-effective stump grinder for medium to large-sized stumps. Diesel power provides plenty of muscle for grinding large stumps, while a standard telescoping tongue and wide cutter swing make for minimal repositioning at the stump. It rides on a single heavy-duty single axle for easy towing and maneuvering. 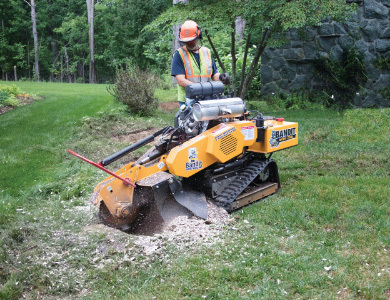 Bandit’s largest wheeled stump grinder is a popular choice for companies needing a high-performance machine capable of quickly clearing large stumps, yet still has the size and maneuverability for backyard removals. Despite its size, with the dual drive wheels removed the Model 2890SP can slip through a 36-inch backyard gate and cross delicate lawns. With a broad cutter swing and aggressive horsepower, the Model 2890SP can grind a two-foot diameter stump in a matter of minutes. 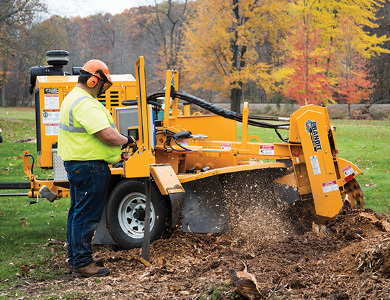 A long-time track favorite for tree service companies, stump grinding professionals and land clearing contractors, the Model 2900 Track delivers big horsepower and grinding power in a package that retains a good deal of manueverability. It rides on a turf-friendly rubber track undercarriage that can expand to 54 inches for stability, and retract to 35 inches to clear narrow backyard gates. An very wide side-to-side cutter swing with big horsepower options make the 2900T the best choice for grinding big stumps quickly and efficiently.